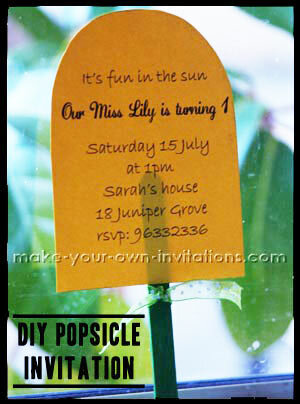 Now this is a great idea for a homemade DIY summer party invitation. Why not create a popsicle or iceblock invitaton. They are fairly simple to make and do not require many materials - just card and popsicle sticks that you can buy from your local dollar store or supermarket. 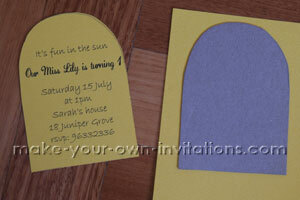 Thi invitation is perfect to set the tone for a summer birthday party or celebration. 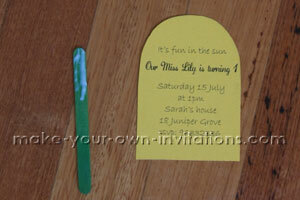 Your guests will be delighted to receive such a fun and quirky invite. cardboard for template - from a cereal box will do. 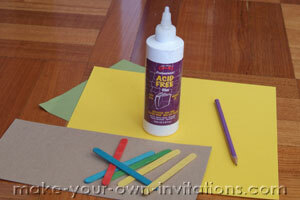 Sketch the shape of a popsicle onto cardboard from an old cereal box. I drew my shape by first drawing a rectangle. I then rounded the top half to give me a symmetrical shape - Remember that your homemade invitations dont have to be perfect. The dimensions for my popsicle template were 3 1/8" x 4 3/8". You can adjust the size to suit your needs. 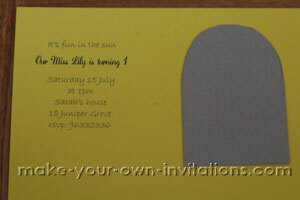 Use a word processing program on your computer (MS Word, Wordpad etc) to create the text for your invitation. I found a couple of fun fonts to use. Make sure that you fit the wording into your specified dimensions. Print on to scrap paper to test that it is the correct size. When you are satisfied with the layout, print on to the yellow cardstock. 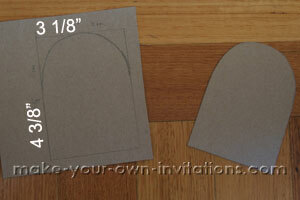 Lay the template over the top, trace around the template and then cut out the invitation with scissors. Grab a popsicle stick. We had a bunch of colored sticks in the craft box so we chose a green stick. You're completed party inivte will look something like this one. Remember that you can ammend any of the dimensions to make your popsicle bigger or smaller as you like.